COSTA RICA NEWS — Mario Gilberto Solano Quirós, known as “Marito Mortadela”, collapsed Wednesday morning in front of the Mercado Central, downtown San José, while doing what he has been doing for more than two decades, singing out his special brand of tunes. Marito is a legend of the streets of dowtown San José. Not everyone knows Marito personally, but everyone knows of him. 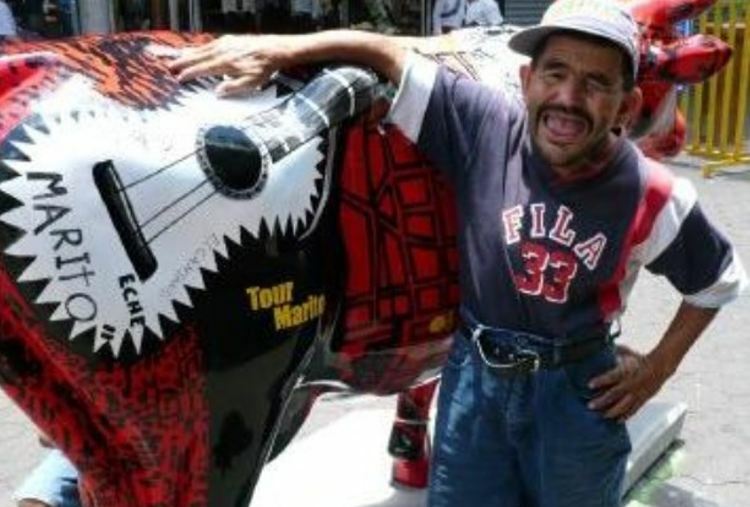 He was even honoured with his “cow” from the Cow Parade that figured in the streets of San José in 2008. Marito suffered a cardiac arrest, doctors say his condition is critical and being guarded on his progonsis. He is being treated for Hypoxic ischemic encephalopathy (HIE), a condition in which the brain does not receive enough oxygen. HIE can be fatal. Brain cells can begin dying after four minutes without oxygen.